Headmaster: E. ARMITAGE. M.A., B.Sc., J.P. 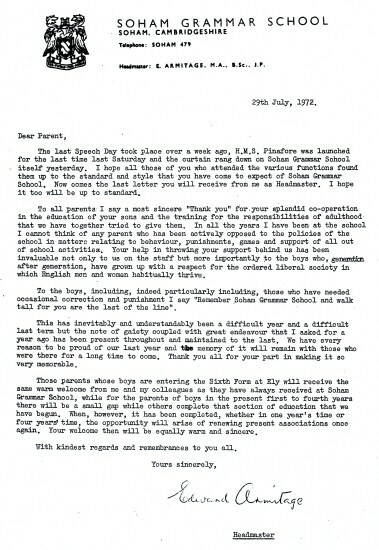 The last Speech Day took place over a week ago, H.M.S. Pinafore was launched for the last time last Saturday and the curtain rang down on Soham, Grammar School itself' yesterday. I hope all those of you who attended the various functions found them up to the standard and style that you have come to expect of Soham Grammar School. Now comes the last letter you will receive from me as Headmaster. I hope it too will be up to standard. To all parents I say a most sincere "Thank you" for your splendid co-operation in the education of your sons and the training for the responsibilities of adulthood that we have together tried to give them. In all the years I have been at the school I cannot think of any parent who has been actively opposed to the policies of the school in matters relating to behaviour, punishments, games and support of all out of school activities. Your help in throwing your support behind us has been invaluable not only to us on the staff but more importantly to the boys who, generation after generation, have grown up with a respect for the ordered liberal society in which English men and women habitually thrive. To the boys, including, indeed particularly including, those who have needed occasional correction and punishment I say "Remember Soham Grammar School and walk tall for you are the last of the line". This has inevitably and understandably been a difficult year and a difficult last term but the note of gaiety coupled with great endeavour that I asked for a year ago has been present throughout and maintained to the last. We have every reason to be proud of our last year and the memory of it will remain with those who were there for a long time to come. Thank you all for your part in making it so very memorable. Those parents whose boys are entering the Sixth Form at Ely will receive the same warm welcome from me and my colleagues as they have always received at Soham Grammar School, while for the parents of boys in the present first to fourth years there will be a small gap while others complete that section of education that we have begun. When, however, it has been completed, whether in one year's time or four years' time, the opportunity will arise of renewing present associations once again. Your welcome then will be equally warm and sincere. With kindest regards and remembrances to you all.